Nowadays, ever since the creation of our beloved photo editing program Photoshop and similar variations, taking the perfect shot with your camera really doesn’t matter, as some will say. Some will also argue that what matters is how good your Photoshop skills are. Well, you wouldn’t hear that from some professional photographers. Nor would you hear that it doesn’t matter what camera you have to capture the right moment with perfect lighting, the right lens, shutter speed or your aperture setting. Someone like, Pepper Yandell, on the other hand, who knows a thing or two about mastering Photoshop to create a realistic composite photo, can simply blow your mind. It may not look like it came directly from the memory card of the latest Canon, Nikon or even the newest Sony DSLR combined with a $10K lens, but it gets your attention – in a good way. Don’t get us wrong, great photographers are exactly that, individuals who may or may not have the countless hours to spend behind the screen of a computer to edit their photos to creations of “art.” They take great photos from the get-go selecting the prime location and timing everything just right. 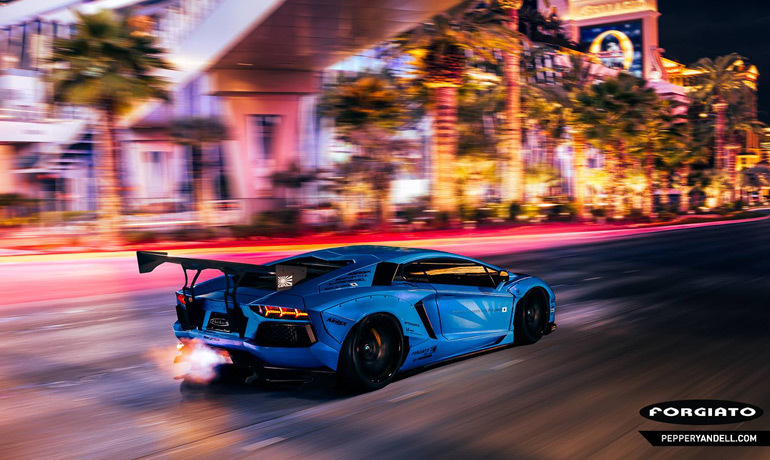 On both ends of the spectrum, we respect all types of work, even Pepper Yandell’s creation of the Liberty Walk Lamborghini Aventador below where the video gives us a quick time lapse demonstration creating the artwork you see above. This guy is a beast at this stuff!